Technology and the rapid growth of data can be a double-edged sword for modern marketers. On one hand, you have access to more information and tools than ever before — but, on the other hand, trends and customer expectations shift quickly, and it can be difficult to keep up. Today, consumers not only expect brands to provide them a highly relevant and customized experience, they also demand a seamless experience across all channels and devices. How can you, a busy marketer, meet these growing expectations? It’s time to meet your new sidekick: omnichannel marketing. Up until the early 2000s, the majority of marketing efforts relied on mass pushes — sending one, well-crafted message to an entire audience. It wasn’t unusual for billboard placements, ads in print publications and traditional mail to consume the majority of a company’s marketing budget. The conversation was almost entirely one-way. But the dawn of the digital era flipped the script and gave customers dozens of new ways to interact with brands. Omnichannel marketing is an approach that brings together all of these experiences — from brick-and-mortar to online, including everything from social and in-app communications to email — into one cohesive, seamless user experience. And when it comes to marrying together all interactions, email is the linchpin. How Does Email Fit Into an Omnichannel Strategy? It’s impossible to have a successful omnichannel strategy without email. And we’re not being hyperbolic — email is critical to launching and maintaining an omnichannel approach. First, while email is one of the oldest digital communication platforms, it remains the most important. And it doesn’t look like that will change anytime soon. The number of emails sent and received per day will exceed 246 billion by the end of 2019, according to Radicati. Secondly, email is a data goldmine. 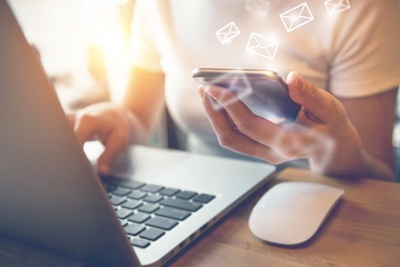 In addition to learning customer behaviors by tracking how and when contacts engage with your messages — and well as what messages they prefer — you can also use email to learn how your audience spends their time online. Hashed emails allow you to gather data about your subscribers all across the web so you can learn their habits and optimize your omnichannel efforts to meet their needs. For example, knowing customers are most likely to make an online purchase after 7 p.m. will help you better strategize Facebook ad campaigns, push notifications and email sends during that time of day. For marketers who are still struggling to bring together multiple channels into one experience, omnichannel marketing can seem daunting. But getting started isn’t as difficult as it looks — especially if you already have a healthy email marketing strategy and sizable contact list. By leveraging the data you do have, you can begin learning more about your subscribers, their habits and where and how they interact with your brand. Time it right. Segment email sends based on time zones and when you know your contacts are most likely to open them, based on their past behavior. Thank them for being an ambassador. Create a list of customers who you identify as ambassadors, based on their participation in referral programs or even those who actively share about your brand on social media. In a day when so much is automated, a personalized “thank you” can go a long way. These are just a few ways you can use data to start connecting the dots between your customers’ behaviors across channels. Not only will this create a more seamless experience for them; it will Once you have this information, you can connect the dots and create an omnichannel experience that exceeds your current and prospective customers’ expectations. Ready to get the data you need to launch a powerful omnichannel marketing strategy? Try InstantData free today!